Died golden baritone Dmitri Hvorostovsky. Two and a half years he struggled with brain cancer. I went through several courses of chemotherapy, returned to the stage, was again treated ... He was 55 years old. 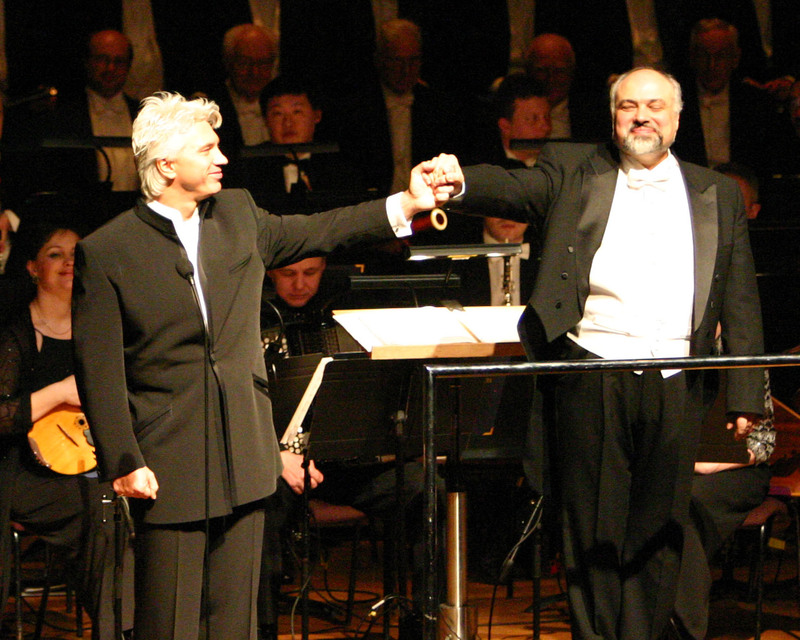 His close friend, conductor Konstantin Orbelian, talked about the last days of the life of an outstanding artist. The famous baritone was an idol for a whole generation of opera singers. Dmitri Hvorostovsky was admired and dreamed of working with him. The famous conductor Konstantin Orbelian and the singer knew each other for more than twenty years, they not only cooperated, but also were close friends. They performed hundreds of concerts, recorded more than twenty discs. Orbelian confessed that he managed to say goodbye to Khvorostovsky on the eve of his death, as reported by "Komsomolskaya Pravda in Petersburg".He had no illusions: a famous friend of Hvorostovsky spoke about the last days of the singerOn Tuesday, at nine o'clock in the evening, he was in the hospital by the artist's bed, and on the afternoon of the fourth night Khvorostovsky's wife reported that he had passed away. According to Konstantin Orbelian, the singer could not talk for the last five days, he was in the hospital, where people are not being treated, but simply facilitate their departure from life.While he was in the hospice, relatives could say goodbye to the singer. Hvorostovsky was visited by parents, children, friends. Recently they were in the clinic every day. As explained Orbelian, we can not say that until the last minute he was conscious. Also the conductor noted that very often the eyes speak much more than some words.According to a friend, Dmitry Hvorostovsky understood everything perfectly, he had no illusions. From the very beginning, two and a half years ago, the singer was told that the tumor was malignant. The legendary opera baritone underwent treatment. The disease receded for a time, but then it got worse again. Orbelian remembered the last concert of Hvorostovsky in Russia. He noted that speaking in his native Krasnoyarsk, he said goodbye to all the fans. In recent days, close to the artist in the London hospice were the closest people, among whom Russian poet Lilia Vinogradova. We called Dmitry Khvorostovsky's close friend in London. "I've known him for years." We worked together and were very close friends. A huge loss for the country, for the planet and for me personally, because I lost a very close person, "says Lilia Igorevna. "Since Sunday I've been in London, I've been around for a day ... Well, there's no more of it." But he stayed forever. It's a huge huge huge artist. This is national pride, the property of Russia. Everyone should be proud of him. This is the property of the planet. He is loved very much everywhere. Wherever he worked, or appeared, it is always adoration, always veneration, because this man was born for the stage, for art. - He said: "Someone goes to my concerts for the sake of prestige. Then I need to turn everything around to get my soul out! " And he did it. The audience sobbed, applauded standing, he was repeatedly called for an encore. For this he always worked hard, his highest level of performance achieved constant rehearsals. He did not stop working, did he? - Never! Not for a second! He sang to the last minute, was engaged ... This was the basis of his life. - The smaller the star, the more pathos. He was very modest. He did not have to prove anything - his incredible gift was obvious.- In early June 2017 Dmitry Alexandrovich gave a concert in his homeland in Krasnoyarsk. Did he feel that this was a farewell?" It was very important for him to come to Krasnoyarsk. He has an inseparable connection with his native city. It was very important for him to sing in Krasnoyarsk. Although the doctors discouraged him from flying, he arrived there in grave condition. And thank God! And rightly so. It was very important for him. "Where are his parents now? ""My parents are in London now." I'll fly with them to Moscow today or tomorrow. Now we are thinking about how to take tickets, how to take them away. It's very hard. The worst thing is the grief of the parents. They arrived yesterday, they managed to say goodbye to their son. This is a great happiness. 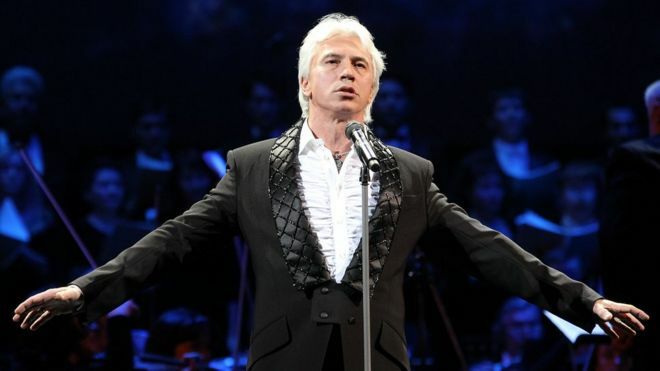 - Can Russian fans hope for the opportunity to bid farewell to Dmitry Hvorostovsky in Russia? - There will be a farewell. It is still unknown about where and when. He only left tonight. It is not known when his body will arrive in Moscow. "In what condition is his wife Florence?" "She's holding on." We were all together, with his younger children, parents, his friend conductor Konstantin Orbelian flew ... We were all together.- In recent days, Dmitry Alexandrovich was conscious? "He heard everything." But he could not speak. But he heard and understood everything. He answered with his eyes, he nodded his head yes or no. He saw us all. He was certainly under the influence of painkillers, but he was in himself.- When it became clear that everything is hopeless?- Hard question. Of course, when you love a person, you believe to the last. Probably for me, when Flo called on Saturday and said: "Fly." And I flew. On Saturday, the inevitability became clear ... But he is a very big fighter. Extraordinary force of man! "I did not want the children to see him like this""We were very close friends with Dima, we just did not publicize this," said Pavel Astakhov, a former presidential envoy for the rights of the child, told KP. - More than 10 years old were friends with families. We visited each other at a party, we spent holidays together.- How did you meet?- We crossed over at one event. In general there was a funny story. When I started working as a lawyer in the 1990s, I had defendant Hvorostovsky. I said this name, and my colleagues said: "Oh, do you defend that same Khvorostovsky?" I told him this story when a few years later we met. He laughed. Acquaintance grew into a strong friendship.- When was the last time you saw Dmitry?- My wife and I visited him in September. We stayed at his house in London. Of course, it was noticeable that it was hard for him. He did not want to be seen in the situation he was in recently. Next to him was always a family. We corresponded with him every day, we were constantly on call, 24 hours. "Why did he die at the clinic, and not at home? "- He himself asked to take him to the clinic. Experienced for the children, how they will react to everything. Children (Nina - 10 years, Maxim - 14. - Ed.) It would not be easy to see everything ..."He left a will? "- Yes. Asked to cremate him. Part of the ashes are buried in Moscow at the Novodevichy Cemetery. A part - in his homeland in Krasnoyarsk. Now I came out with an initiative to perpetuate his memory - that at least the music school in Krasnoyarsk, which he graduated from, was given the name of Dmitry Hvorostovsky. "November 2016 is the limit""Few people know that doctors, as soon as they examined his tumor in May 2015, told Dima: he will live a maximum of 18 months," Pavel Astakhov continues. - He understood that November 2016 - he had everything, the limit. But he fought. And after having been measured by doctors, he lived another year. Even seriously ill patients continued to do good deeds. Three concerts, which we managed to do with him in 2014, 2015 and 2016, were charitable, in support of sick children.Even in 2016, when his condition was already heavy, he performed. Money from his concert on June 1 at the Bolshoi Theater "Dmitri Hvorostovsky for Children" was handed over to Rusfond, about 200 children with oncological diseases received help. Imagine: the deadly patient Dmitry sings for the sake of children with similar illnesses!Then his two dreams were realized at once. First, make such charity concerts. And secondly, to sing in the Bolshoi Theater. It so happened that Dmitry did not have any concerts at the Bolshoi Theater. He sang on all the world stage, at the Mariinsky Theater, but he was not invited to our Bolshoi. And he dreamed of giving a full-scale big concert here. Vladimir Urin, the director of the Bolshoi Theater, asked: "Why do not you sing with us, Dmitry Alexandrovich?" He said: "How? Invite! "And he was immediately invited. In December, a performance was staged - the opera Don Carlos. But Dima could not because of his health. The play had to be canceled. But his dream did come true - he gave a concert on the Big theaters stage. Tumor found too late- Hvorostovsky understood that he was doomed, or did he hope for a miracle?- I hoped. We all hoped. The tumor was large. And it was discovered too late. Americans, experts on such things, having looked, said that they do not undertake to operate. True, the first chemotherapy gave the result. The tumor stopped growing. We were delighted. He, too. We saw how he feels, his soul rushes, and believes, and does not believe ... But in the spring of 2017 it was clear that his condition was very difficult.Then he flew to St. Petersburg, fell, damaged the radial nerve, in fact the hand was paralyzed. The doctors tried to somehow relieve the pain, they fixed their hand. And he said: "I'll still fly to Krasnoyarsk. I have to go there. " The doctors objected, considering his state of health. But it is very obligatory. He promised to fly to his countrymen - and flew in. He appeared before them with a black bandage on his hand, which I suggested to him - in the color of the suit. The way it was hard for him at a concert in Krasnoyarsk, everyone saw it. In fact, he said goodbye to everyone. "Three times I could die"- Before that, Dima was going to fly to a concert in Krasnoyarsk in December 2016, - continues Pavel Astakhov. "And then he miraculously escaped death." Dmitry gave a concert in the Kremlin, then in St. Petersburg. In the evening on the eve of his flight to Krasnoyarsk he felt ill and canceled the flight. He had a lung rupture. If it had happened on the plane, that's all. The new, in 2017, he met in the intensive care unit with a lung punctured in two places. Then in ten days there was a pneumothorax (when the air starts to accumulate between the chest wall and the lung.) - Ed.). In general, after a lung and pneumothorax rupture, people die, in both cases. And he understood that. He told me: "Pasha, I could die three times in this life, but I'm alive - that means I have not done everything yet!" We took him back to London. And when he began to feel better, began to walk, walk, he said: "I will definitely come to Petersburg and Krasnoyarsk." And he kept his word, came in the spring and acted, whatever it cost him. "He said that he could have died three times ... And the third when? "- At the age of 30 he almost crashed on an airplane. He said that the plane crashed and he almost died. After that, he reconsidered his life, changed a lot in it.Doctors called a miracle that he with such a diagnosis found the strength to return to the stage, to perform. He always came at least two days before the concert to rehearse. He was engaged every day, conductors, composers, phoniatrists, otolaryngologist came to him-all worked with him, checked ligaments, and throat. Dima took great care of his voice so that people would enjoy his performance. He lived a very bright life. In the human dimension, of course, short. But in this short life he did as much as a million people will not do. Who will dive deeper into the hole- Dima was, on the one hand, very open. But, on the other hand, few people started up in his life, - continues Pavel Astakhov. - In general, he was very cheerful, hooliganist. I like jumping in the ice, and so is he. We arranged competitions - who will dive deeper, who will stay longer under water. They jumped with him from great heights, and even with children. Who is more pressing on one hand - was also our favorite competition.We used to meet in the most unexpected places. In 2010 I went to Irkutsk on a business trip for children's institutions. I'm settling in a hotel. And in it ... Dima lives. And we go to the gym three days together. I remember one local newspaper wrote a report: they say that Khvorostovsky and Astakhov lived in the hotel, they could be seen in the gym in the mornings, and then they "enjoyed scrambled eggs with a doctor's sausage". We often joked with him: "Let's go and enjoy the scrambled eggs with the doctor's sausage! "Or you can recall Tobolsk, in July 2013 I went there with an inspection at the Children's Home. And at this time Dimini concerts. The day after his concert we went to the monastery. He was very interested in everything, asked: why do people go to this big icon of the Virgin, why is this queue worth? I explained to him that this miraculous icon ... He was drawn to God. At a conscious age, more than 30 years old, he was baptized.He was sick in 2014, but he did not know about it. And just at that time he wrote down a collection of liturgical hymns. Everyone knows about his romances, military songs, opera, even about the pop album with Igor Krutym. But few people heard the liturgical chant recorded by Dmitry, for which he was awarded the Order of the Russian Orthodox Church - the Order of Sergius of Radonezh. Male singers did not want to perform a duet with him because of his beauty- Dmitry spent his life working on wear and tear. I also spent very much in sports myself, - actress Victoria Lazich, who talked with Hvorostovsky, told "KP". - We told him just before the illness, that we must slow down, take care. But he could no longer change his way of life - he belonged not to himself, but to the world, to the spectators. He believed that he should justify the trust of people who believed in him. And especially the opera singer Irina Arkhipova, who played a key role in his fate. I witnessed how many years ago she said publicly, looking at the young, then little-known 30-year-old Dima: "He will conquer the world." I was friends with Arkhipova and I know that she was a very tough person. The location of Arkhipova was extremely difficult to obtain. She could sharply say: "You are mediocre, why do you waste time?" But in Dima, she immediately saw the future star. Certainly, Dmitry has a special destiny. The conquest of Moscow, Europe, the world stage in such a short period of life. And he remembered me that guy in jeans, who came to visit me at home on Patriarch's Ponds. Eyes shone, energy crazy! He ate with such pleasure that when he left, my mother was the one who packed the box of chebureks with him: "Did you like it? Take it. "Only with the advent of his second wife Floshi (the Swiss-Italian singer Florance Illi - Ed.) He was in really reliable and caring female hands. Of course, he was fantastically beautiful, always liked women. By the way, he said that sometimes he interfered with beauty. The singer drew to perform with him in a duet. But male colleagues ... Against the background of the most flabbergasted opera singers, Khvorostovsky looked like a prince. They did not want to sing a duet with him - they suffered from self-esteem ...Because of the betrayal of the first wife could lose a careerHvorostovsky is called a Krasnoyarsk nugget. At the beginning of the creative path, the golden baritone almost broke his life because of jealousy. Then Dmitry decided to arrange a young wife Svetlana, a dancer of the Krasnoyarsk Opera and Ballet Theater, a surprise. Returned from the tour home before the deadline and ... found his wife with a friend. In a rage he beat both of them, after which a big scandal erupted. Dmitry wanted to drive him out of the theater, they were going to open a criminal case. But for the artist stood opera singer Irina Arkhipova.Later, Hvorostovsky moved his wife to England, where she gave birth to twins - son Danila and daughter Sasha (now they are 21 years old). Dmitry adopted and little Masha, Svetlana's daughter from her first marriage. But personal life did not work out. Due to constant scandals with his wife Hvorostovsky opened a stomach ulcer, the singer began to abuse alcohol.Salvation was a new love. In 1999, 37-year-old Khvorostovsky came to Geneva to perform the Don Juan party at the local opera. His partner was the 29-year-old singer Florance Illi. She fell in love with a Russian handsome man, and he reciprocated her. In 2003, the couple had a son, Maxim, in 2007 - the daughter of Nina.But first Dmitri had to go through a divorce, which began in 2001 and lasted for several years. It was then that the singer's earnings became public. At the time of the divorce, Khvorostovsky's annual income was $ 1 million. In the 2000s, the artist's fees rose to $ 2 - 2.5 million, and the former wife filed for a review of the case. The court increased the amount of child support first to 170 thousand pounds a year, and in 2009 - to 195 thousand. - Dima had a serious divorce, he was very worried, - the "father" of the singer Alexander Stepanovich told "KP". - Sveta was offended at him. After the divorce, they stopped communication altogether. His second wife, Florence, wanted to get to know her, be friends, especially since the children both communicate from the first and from the second marriage. Sveta said no. How to cut off. But, having heard about Dima's illness, she called with words of support. For the first time in many years.Svetlana died before: in 2015, she fell ill with meningitis, because of which sepsis began. She died on December 31, 2015. Khvorostovsky then promised that he would love older children for two.By the way, the son of the artist Danila also chose a musical career - he plays in a rock band. Daughter of Alexander became an artist. In his youth he played in a rock bandFrom the book of Sophia Benois "Dmitry Hvorostovsky. Two women and music "(publishing house" Algorithm "):"In his young years, being a big fan of rock, Dmitry nearly quit his studies - he became a keyboard player and a bright leader of the group" Rainbow ". The guys played in restaurants and clubs in Krasnoyarsk. As befits a rocker and a rebel, Dmitry, as he himself admitted, was too violent, went into hobgoblins, fought nastily, so that in fights, in several places his nose was broken. The pernicious habits did not change even when he dropped the Rainbow, entered the music institute, while still a student, became a soloist of the Krasnoyarsk theater, got a flat from the local party's regional committee for twenty years, and soon after winning the prestigious international competition in Cardiff, Britain moved to Moscow. "I took vodka with stress"
- I earned myself an ulcer because of the experiences associated with divorce, - told Khvorostovsky. - I should have sung Rigoletto in Houston, but slowly faded. If I did not call my mom, I probably would not be talking to you right now. She said: "Immediately go to the hospital!" After discharge, I had to eat meat, drink wine, to restore the loss of blood. I barely managed to get over to the premiere ...The artist does not hide that he tried to cope with problems with the help of strong drinks.- I drank very strongly, with long drinking-bouts, which were connected with both successes and failures. At some point, memory began to fail, I did not always control my actions. It was already an alarming signal. Soon there were problems in the work. The threat of losing the profession became real ... In early 2002, I finally stopped drinking. Actually, from the moment I met Florence, my life has changed for the better. She saved me. "I'm more comfortable singing in shorts"According to Hvorostovsky, everything in his "life and career is built on overcoming - himself, his doubts, his pessimism. "Of course, over the years he has changed a lot, but sometimes that youthful impudence breaks through him. Once after the concert, he confessed to the journalist:- I'm still a little fresh, still hot, warm after the concert, and you ask me about beauty. Yes, I spit on the beauty, to be honest. He spat. If I could, I would go out just in my underpants singing, because it's more convenient. But there are costumes, so I put on costumes and put on, but it's absolutely secondary. "